Voice is an important tool in a teacher's bag of tricks. Without a voice, teaching within a traditional classroom becomes impossible. With a sore or straining voice, it is more than difficult. This course has been designed to lead you to a healthy, strong, reliable voice where you can achieve the volume you want without strain. These courses are delivered over a 6 week period to maximise the use of the course materials. You will learn simple but effective exercises to strengthen this misunderstood asset for a lifetime of vocal confidence in the classroom. Each option has a free trial version so you can test it out to see if this is a course your would like to participate in. The first week out of the 6 weeks is provided in this trial. Just click the link and choose the free trial option. 2. Comprehensive Teachers Voice Course - This course has the text and video above as well as many support resources on your way to becoming the best voice user you can be. This course includes printable and recorded versions of the exercises to make it easy to bring them into your life on a daily basis. You will also have email contacts so you can receive guidance when required. This course is 6+ hours. This course is great value at $249! 3. 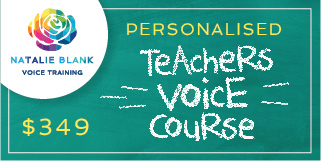 Exclusive Teachers Voice Course - This course has all of the resources available in the Comprehensive Course as well as two half hour video calls to have your exercises checked so you know you are completing them correctly. These calls will be recorded and sent through to you for your future reference. Get extra support for only $349.